Wherever you are on the tech spectrum, you’ll be fascinated by the changing landscape in the world of tech. And it is no secret women are vastly underrepresented in high tech fields. Explore how culture and socialization often keeps women on the sidelines of a predominantly male industry, why that’s a problem and how a group of women right here in St Louis are shifting social biases and opening doors to tech careers for others. Haley Shoaf is the VP of Impact at LaunchCode, a nonprofit organization dedicated to solving the tech talent gap by providing free, high-quality training and job placement to driven individuals who lack typical credentials. 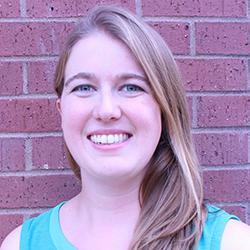 In her role, she oversees student program operations and community engagement. Haley originally came to St. Louis as a Venture for America Fellow and remains an active VFA alumnus. She is a graduate of the Science, Technology, and International Affairs program at the Georgetown University Walsh School of Foreign Service. Passionate about prison reform and education, she formerly headed the Georgetown Prison Outreach Program and currently runs a coding education program for inmates in Missouri. Please advise your server of any food allergies. Thank you.